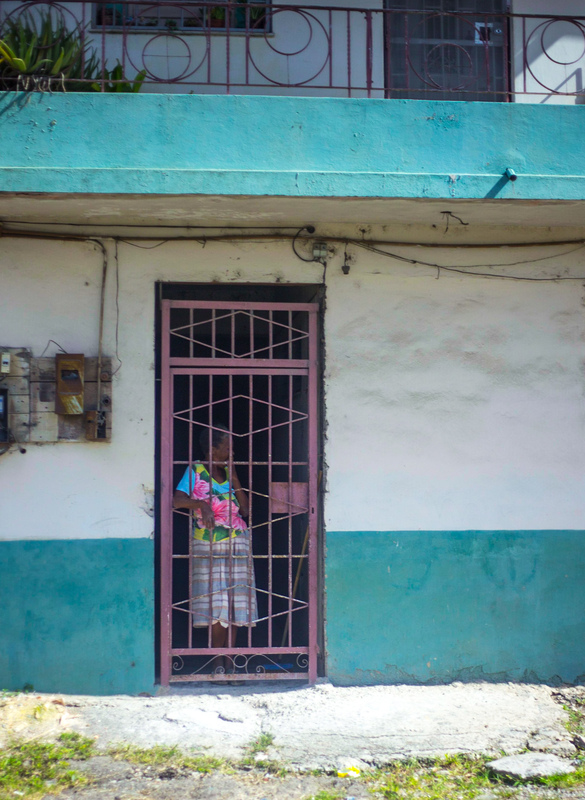 Traditionally houses in Trinidad are high single storey in long terraces running between the cross streets . 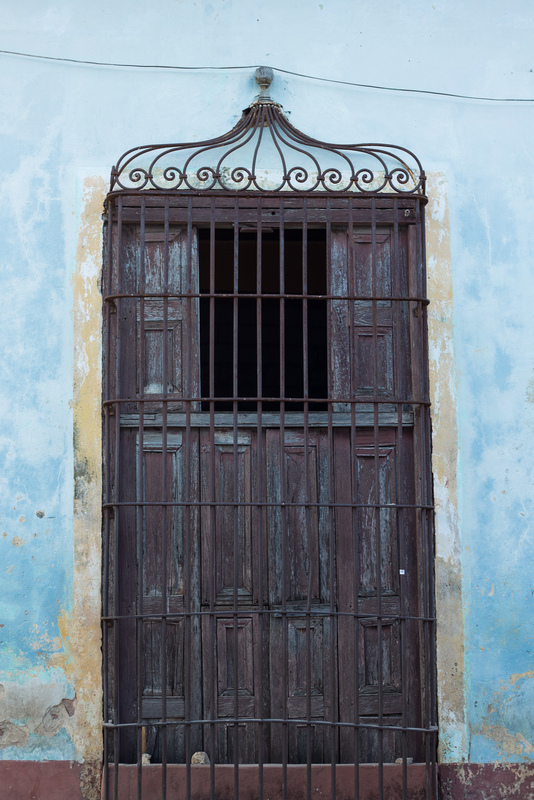 They have grilles, rejas de la ventana over their tall windows and wooden shutters, contraventa inside. 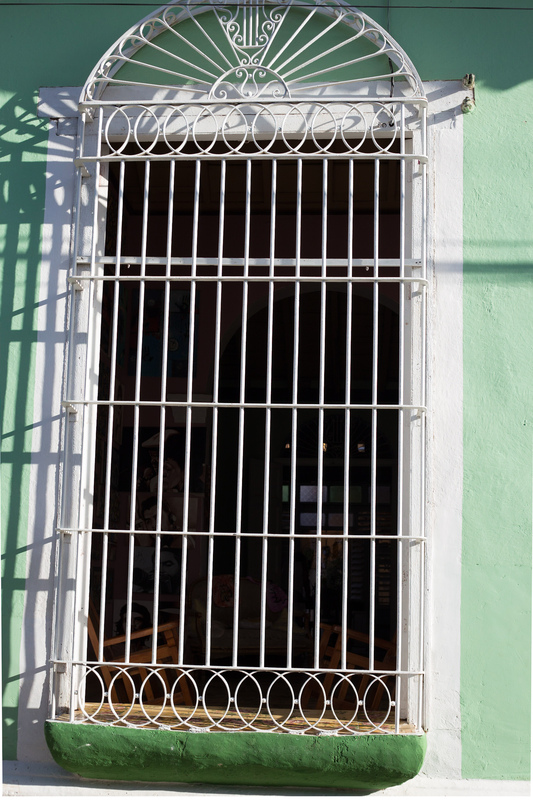 Historically these grilles were made of wood, madera, in simple rod-like designs or for the Spanish sugar barons, ornate turned verticals and carved top and bottom boards. 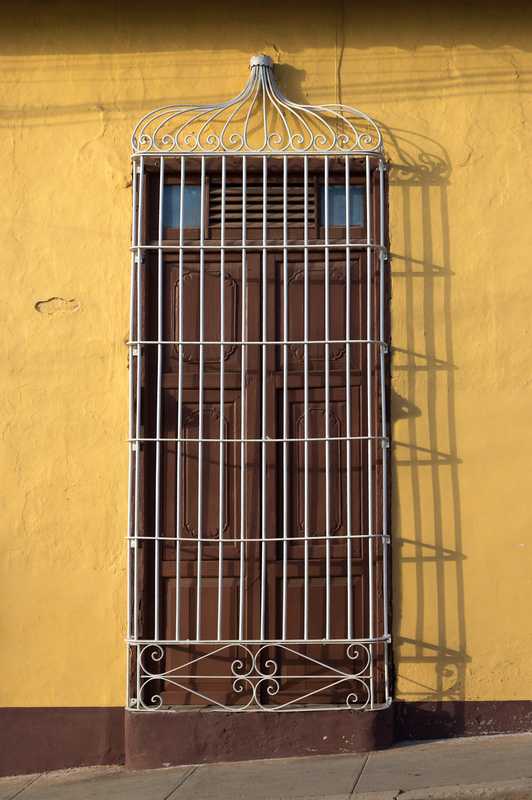 Grilles were also made from wrought iron, hierro forjado where the iron-workers were adept at making wonderfully decorative swirls and details, latterly grilles might be made with simple rebars (reinforcement bars) barras de armadura, efficient but not as attractive. 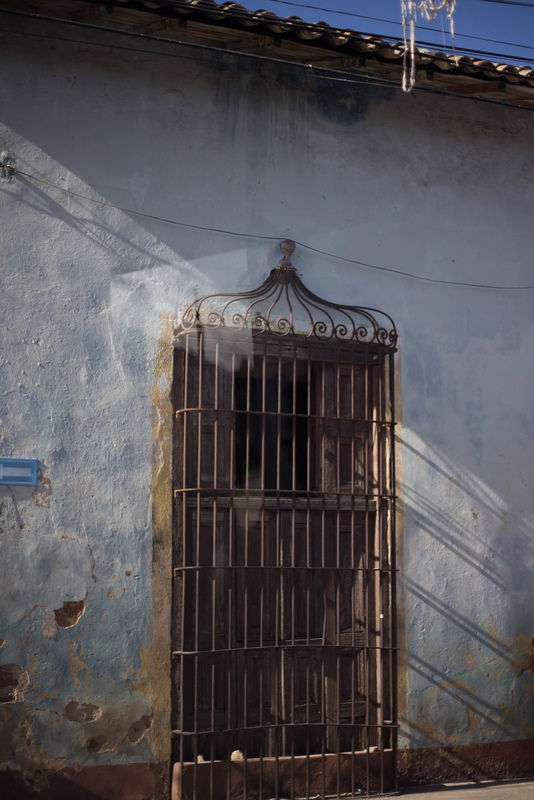 Just an old grille photographed from within a moving coach but it sums up for me all the things I like about grilles, the rusting iron, the crumbling walls, the late afternoon shadows and the traces of light blue paint over the original brown paint on the wooden shutters. Walls the colour of really ripe lemon rinds, doors the colour of old schools utility brown. 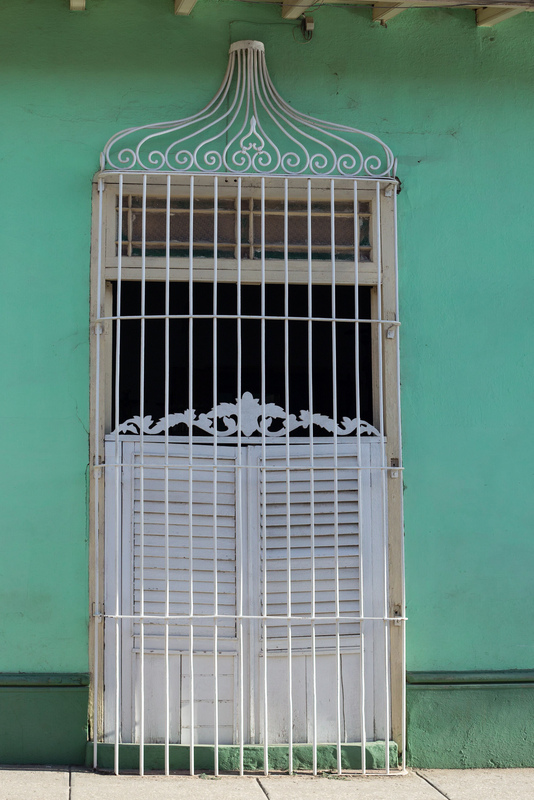 A modern grille, what flights of fancy here as well as a fine example of drawn thread-work in the curtain too. Sunray arch above and peppermint toothpaste coloured walls. 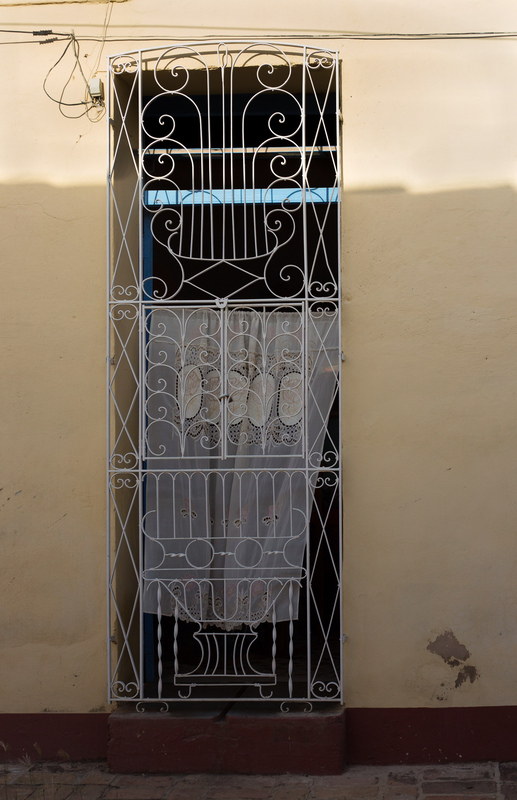 A modesty screen made from wooden louvres with a flourish of carving to decorate the top. 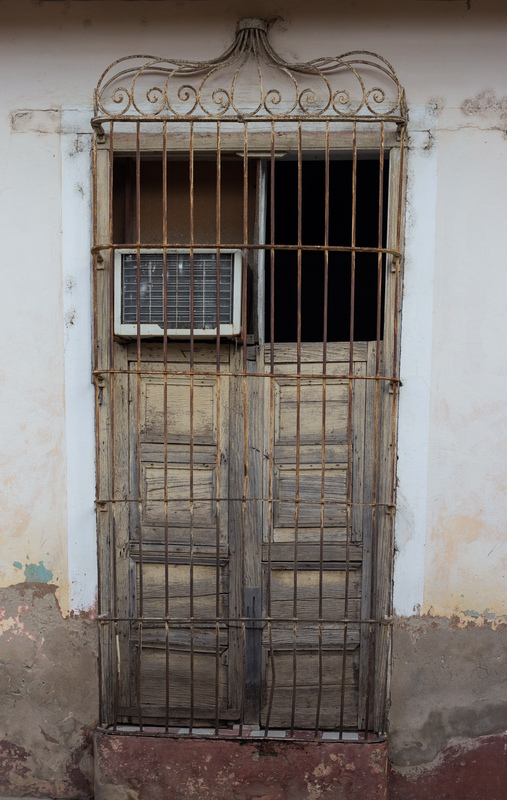 The owners spent their extra cash on an air con unit instead of new shutters! It seems that some time ago the owners decided not to repaint the shutters light blue to match the plastered walls but I love the faded paint. So ften as we drove past a doorway, we would see a figure held behind their rusting grilles, just once in a while a hastily taken image would be in focus. Here the colours of the woman’s flower strewn top shone out like a beacon against the unusually pink-painted grille..
Again photographed from a moving coach, I just missed the whole of the painter’s body and the grille but the modern design and bright red paint are good even if not wholly visible.